Pinta is a simple, easy-to-learn image processor targeted at occasional users and beginners; more experienced users will miss a variety of features. Given the less-than-intuitive controls in GIMP, many less experienced users long for an easier image processing solution. Pinta  targets this group. The program was originally created from the source code of the Paint.NET  program, which was originally open source but is proprietary today, although free. As a result, Pinta (the name is an anagram of Paint) is based on the free.NET Mono implementation, an open source implementation of Microsoft's .NET Framework, which fails to generate enthusiasm with many Linux users. Whereas Paint.NET uses a proprietary storage format for its files, the Pinta developers use the tried-and-trusted ORA OpenRaster format. ORA is supported by many free graphics tools (Table 1), which at least makes exchanging data easy. The format also includes enough functionality to integrate all of the features of Pinta files. After setting up the current Pinta version 1.5 from the distribution repositories, you will see an uncluttered window at first launch (Figure 1). Holding Ctrl and rolling the mouse wheel zooms the view in the image window; however, Pinta does not support movement of content by holding down the center mouse button. Window widths are adjusted at the sides with the mouse. Figure 1: Pinta comes up with an uncluttered workspace. In addition to a menubar (unseen) and toolbar (top), you will find a toolbox (1), an extensible color palette (2), a Layers window (3), an Images window (4), and a History pane (5). To load an image into Pinta, you can either use the File menu or drag and drop images from a file manager. The software lets you open multiple images at the same time for editing; they are shown in the Images window (Figure 1.4). You can toggle to the desired image and then edit it in the main window. The details in all the other windows then relate to this image. The toolbox has a manageable number of tools with an equally manageable feature set. The selection tools in Pinta include a rectangle and an ellipse, plus a very restricted freehand selector. The latter relies on the rubber band method and thus always gives you closed selections, which could be an advantage for newcomers to image processing. You can invert the selection by pressing Ctrl+I or using Edit | Invert selection. Pinta does not support soft selections, which are essential for touch-up work, or let you retroactively adapt existing selections. 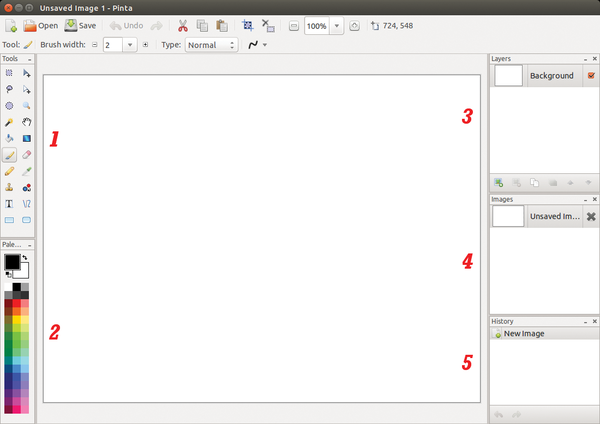 Pinta shows the current toolset in the line immediately above the image window, along with the available options (Figure 2). However, this reduces what is already a fairly tight vertical workspace. The options typically offer very few choices, although this does make it easier to understand exactly what they do. Figure 2: The current tool and its options are shown above the image in Pinta. The paint tools in Pinta include a hard pen, a soft brush, and a fill bucket. The stroke width for the pen and brush is set using separate sliders above the image window. The filler function is a little smarter; you first define the fill mode to decide whether to apply the tool locally or globally (Figure 3). The Tolerance slide control decides the extent to which the fill reaches into the unselected areas. Figure 3: Local (left) versus global (right) filling with Pinta. Both have restrictions but come up with totally different results. Pinta provides four other tools at the bottom edge of the toolbox that let you draw rectangles, rectangles with rounded corners, ellipses, or closed freehand shapes. The tools always use the selected foreground and background colors and stroke width. All of these tools offer the same options and let you draw the content, the frame, or both at the same time. The clone tool, in the form of a stamp, combines the functions of GIMP's stamp and Heal tools (Figure 4). The results are not entirely convincing, although you might be able to improve the outcome with some practice. The tool works more or less like its counterpart in GIMP: The Ctrl key in combination with a left click defines an area of image content, which each following mouse click then paints into the image starting at the defined point. This is like the Aligned clone mode in GIMP. However, Pinta fails to show the source after you have selected it, which can result in repetitive patterns if the source already included previously cloned sections. Figure 4: Using the clone tool correctly involves a learning curve. Pinta's text tool is not really a paint tool because it always applies to the current layer, rather than to a layer of its own. Pinta does not let you move the text to another layer later. However, the program does let you decide whether to show just the outline, the text with the outline, or just the text without an outline. The text tool produces monochrome, uniformly formatted text. Pinta lacks advanced functions, such as aligning text on a path – because it doesn't have a path tool in the first place – and Pinta does not let you edit text that you have entered. A similarly impractical tool is the line tool, which you can use to draw straight lines in the foreground or background. Although it enables antialiasing by default, the lines do not look very appealing. The gradient tool is slightly better: It create gradients from the current foreground to the current background color and supports non-linear patterns. Pinta's journal is a genuine highlight, allowing users to undo an arbitrary number of steps, although it only logs actions in the currently selected step; all previous actions are inaccessible. In addition to tools, Pinta has a number of well-known effects, which reside in a menu of the same name. 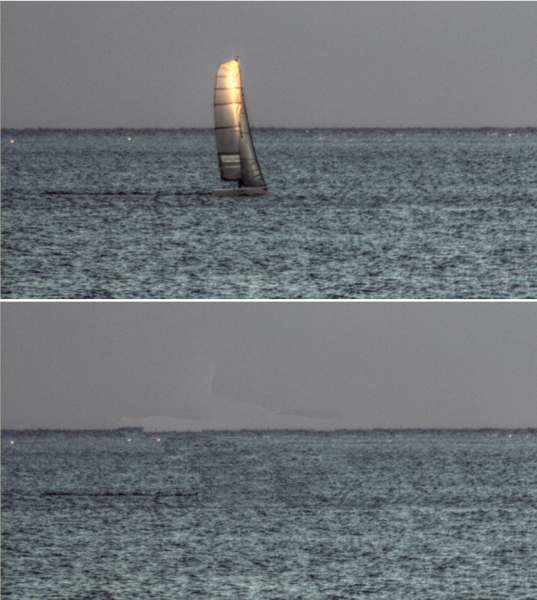 Pinta's effects are similar to GIMP's filters. In addition to the simple blur tools and an effect tagged Glow, with integrated brightness and contrast controls, you will find a very simple sharpening effect. The risk of artifacts is high, as in other image editing programs. Whereas the GIMP developers recommend the use of three-parameter Unsharp masks for sharpening to help you correct artifacts, Pinta does not have a similar solution. The effects grouped below the Artistic menu item are a disappointment because their results are not as satisfactory as those you can attain in GIMP. The only effect that gives you more or less good results is the Relief effect (Figure 5), and you could question whether you really need two fractal effects and a cloud effect. Figure 5: Pinta's Relief effect is one of the few effects to achieve results similar to GIMP filters – in this case, GIMP bump maps. Sophisticated image processing is impossible without layers, and Pinta provides basic support, allowing you to create a new transparent layer and then fill it with color or duplicate an existing layer. Pinta has a far easier approach to copying layer units or a whole layer, because it does not support a floating selection. 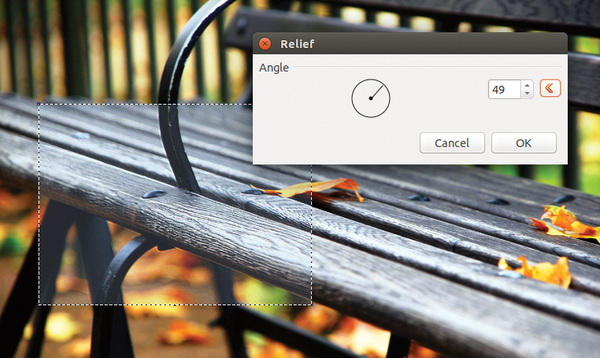 After inserting, you see a normal layer in which you can continue to work normally. Layers can be duplicated and then edited by applying effect filters. However, if you want to juxtapose the results, Pinta does not let you precisely offset or mirror layers. Pinta does have an option for adding multiple images as one layer (e.g., for a collage) by using Layers | Import from file for each image then editing the layers separately and merging them with Merge Layer Down. Pinta only supports a small subset of GIMP's well-known layer mode variants. 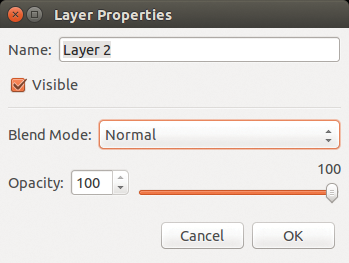 A mode can only be selected in a second step after creating the new layer with Layers | Layer Properties (Figure 6). This approach impedes the workflow, but at least the preview mode works. Figure 6: Pinta supports the use of a number of layer modes. MyPaint is a simple, intuitive, versatile paint program. The software, which is designed specifically for use with graphic tablets, promises users an experience similar to drawing with a pen or brush.